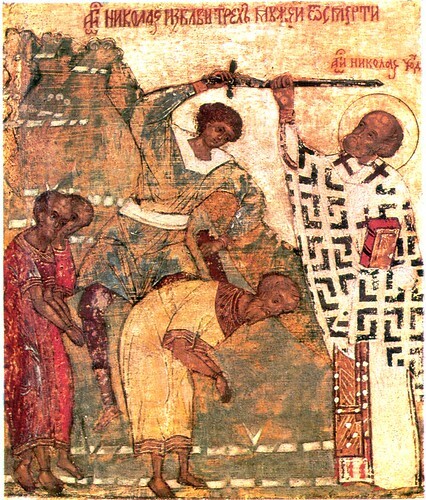 St Nicholas stopping an execution, originally uploaded by jimforest. I’m preparing to teach my course on the Death Penalty again next semester. Each time I’ve taught it, one or another element of the issue has come to the fore. This time, I was asked to highlight religious aspects simply because some of the Honors students need a 2 credit course with significant religion content to meet their requirements. It’s not a difficult request to honor. In addition to the obvious – looking into the current statements of various faith traditions about executions and capital punishment – I plan to bring out the strong non-violence in the earliest centuries of Christianity. So I was delighted to come across this story of St. Nicholas – one I had never heard before – and the icon, on Jim Forest’s Flickr collection.